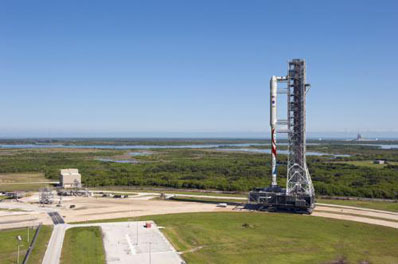 ATK announced Tuesday its Liberty space transportation system will comprise crew and cargo modules to haul seven astronauts and up to 5,000 pounds of supplies and science experiments to the International Space Station on the same flight. The combined crew and cargo capability differentiates ATK from its commercial competitors, which plan to offer only limited resupply capacity on crewed missions. "Liberty's expanded service allows us to bring a commercial capability delivering up to seven crew members, 5,000 pounds of pressurized cargo, along with external cargo in a single flight," said Kent Rominger, ATK vice president and program manager for Liberty. "This results in tremendous value since all other commercial offerings would need two flights to accomplish what Liberty does in one." Astronauts and cargo will blast off on a Liberty rocket, which ATK is proposing for NASA's commercial crew program. NASA expects to award two companies between $300 million and $500 million in 21-month agreements beginning as soon as this month. The space agency plans to release about half that amount of funding to a third company, which will continue development of a commercial crew transportation system at a slower pace. ATK is currently working on the Liberty proposal with private funding, and company officials say government financing is necessary to meet a schedule calling for a first piloted mission to low Earth orbit by late 2015. The aerospace firm has an unfunded Space Act Agreement with NASA, where the space agency shares expertise with ATK but does not pay an award. SpaceX, Boeing Co., Sierra Nevada Corp., and Blue Origin currently have funded Space Act Agreements with NASA. The next round of awards - called the Commercial Crew Integrated Capability phase - will pick up at the conclusion of the ongoing agreements this summer. All companies with funded agreements with NASA must re-compete to continue receiving government financing. ATK, the builder of the space shuttle's strap-on boosters, plans to combine an extended five-segment version of the shuttle solid rocket motor with an upper stage based on the cryogenic core of Europe's Ariane 5 rocket. A seven-person capsule built by ATK and Lockheed Martin Corp. would fly into orbit on top of the two-stage Liberty launcher. A Liberty logistics module will also fly with the crew capsule, carrying up to 5,100 pounds of cargo, including up to four full-size research racks for placement into the space station's laboratories. The crew spacecraft would be made of a lightweight composite shell developed by ATK in partnership with NASA's Langley Research Center beginning in 2007. ATK and Langley built a composite pressure vessel as an alternative to the Orion spacecraft's aluminum-lithium structure. If it proceeds into full development, Lockheed Martin would oversee final assembly of the crew capsule at the Kennedy Space Center. 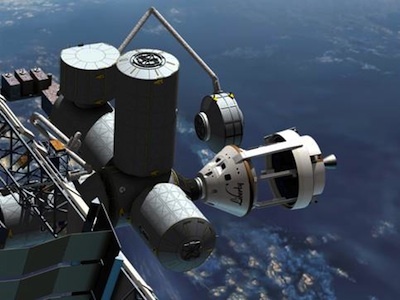 The Liberty cargo module would be based on the Multi-Purpose Logistics Module carried about space shuttle flights to outfit the space station. NASA's requirements for bidders in the commercial crew program do not specify cargo capacity as a decision point for monetary awards.